56. Epelsa (06.01) - Tourism - Map of Spain. Printing variety 5S - 5 digits small. Special imprint EXFILNUCOL ONDA 04. Mint ATM small value (0,01 €). Epelsa (01.10.04). Mod. 16.2 - Literatura - Special printing EXFILNA 2004 (National Philatelic Exhibition). Commemorative cover with ATM (0,27 EUR) and Exhibition postmark. Balance nr. 1403 + text EXFILNA 2004 VALLADOL - printing variety 5S - 5 digits small. Epelsa (01.10.04). Mod. 17.2 - Naturaleza (Nature) - Special printing EXFILNA 2004 (National Philatelic Exhibition). Mint ATM (0,01 €), balance nr. 1403 + text EXFILNA 2004 VALLADOL - printing variety 5S - 5 digits small. Epelsa (01.10.04). Mod. 17.2 - Naturaleza (Nature) - Special printing EXFILNA 2004 (National Philatelic Exhibition). Commemorative cover with ATM (0,27 EUR) and Exhibition postmark. Balance nr. 1403 + text EXFILNA 2004 VALLADOL - printing variety 5S - 5 digits small. Epelsa (01.10.04). Mod. 48 - Año Jubilar Lebaniego - Special printing EXFILNA 2004 (National Philatelic Exhibition). Commemorative cover with ATM (0,27 EUR) and Exhibition postmark. Balance nr. 1403 + text EXFILNA 2004 VALLADOL - printing variety 5S - 5 digits small. Epelsa (01.10.04). Mod. 68 - Motobecane B-44 - Special printing EXFILNA 2004 (National Philatelic Exhibition). Mint ATM (0,01 EUR), balance nr. 1403 + text EXFILNA 2004 VALLADOL - printing variety 5S - 5 digits small. Epelsa (01.10.04). Commemorative cover with ATM with special imprint (0,27 EUR) and Exhibition postmark, and the souvenir-sheet EXFILNA 2004 with the official 1st day postmark. It includes the exhibition invitation. Epelsa (01.10.04). Mod. 68 - Motobecane B-44 - Special printing EXFILNA 2004 (National Philatelic Exhibition). Commemorative cover with ATM (0,27 EUR) and Exhibition postmark. Balance nr. 1403 + text EXFILNA 2004 VALLADOL - printing variety 5S - 5 digits small. Epelsa (01.10.04). Mod. 68 - Motobecane B-44 - Special printing EXFILNA 2004 (National Philatelic Exhibition). 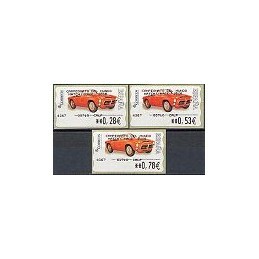 Mint set 3 values (0,27-0,52-0,77 EUR), balance nr. 1403 + text EXFILNA 2004 VALLADOL - printing variety 5S - 5 digits small. Epelsa (01.10.04). Mod. 82 - Arquitectura postal. 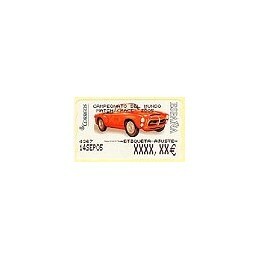 Madrid (Postal architecture) - Special printing EXFILNA 2004 (National Philatelic Exhibition). Mint ATM (0,01 EUR), balance nr. 1403 + text EXFILNA 2004 VALLADOL - printing variety 5S - 5 digits small. Epelsa (01.10.04). Mod. 82 - Arquitectura postal. Madrid (Postal architecture) - Special printing EXFILNA 2004 (National Philatelic Exhibition). Commemorative cover with ATM (0,27 EUR) and Exhibition postmark. Balance nr. 1403 + text EXFILNA 2004 VALLADOL - printing variety 5S - 5 digits small. Epelsa (01.10.04). Mod. 82 - Arquitectura postal. 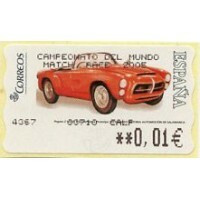 Madrid (Postal architecture) - Special printing EXFILNA 2004 (National Philatelic Exhibition). Mint set 3 values (0,27-0,52-0,77 EUR), balance nr. 1403 + text EXFILNA 2004 VALLADOL - printing variety 5S - 5 digits small. Epelsa (17.12.04). Mod. 96 - DKW con sidecar - Special printing XXV ANIV FRAMA SG. ATM mint (0,01 EUR), printing variety 5S - 5 digits small. Epelsa (17.12.04). Mod. 96 - DKW con sidecar - Special printing XXV ANIV FRAMA SG. Cover with stamp and commemorative postmark (0,27 EUR), printing variety 5S - 5 digits small. Epelsa (04.05). Mod. 104 - Locomotora y Tender - Special printing QUIJOTE 2005. Mint ATM (0,01 €), printing variety 5S - 5 digits small. Epelsa (04.05). Mod. 104 - Locomotora y Tender - Special printing QUIJOTE 2005. Mint set 3 values (0,28-0,53-0,78 EUR), printing variety 5S - 5 digits small. Epelsa (04.05). Mod. 107 - Sammer Gallery. Red Life (1) - Special printing CD ANYS DEL QUIXOT. Mint ATM (0,01 EUR), printing variety 5S - 5 digits small. Epelsa (04.05). Mod. 107 - Sammer Gallery. Red Life (1) - Special printing CD ANYS DEL QUIXOT. Mint set 3 values (0,28-0,53-0,78 EUR), printing variety 5S - 5 digits small. Epelsa (09.05). 110. Pegaso Z-102 SS P Spyder Serra Prototipo 1955. Special printing CAMPEONATO DEL MUNDO MATCH RACE 2005. Mint ATM (0,01 €), printing variety 5S - 5 digits small. Epelsa (09.05). 110. Pegaso Z-102 SS P Spyder Serra 1955. Special printing CAMPEONATO DEL MUNDO MATCH RACE 2005. Commemorative cover (0,28 EUR). Epelsa (09.05). 110. Pegaso Z-102 SS P Spyder Serra 1955. Special printing CAMPEONATO DEL MUNDO MATCH RACE 2005. Mint adjust label, printing variety 5S - 5 digits small. Epelsa (09.05). 110. Pegaso Z-102 SS P Spyder Serra 1955. Special printing CAMPEONATO DEL MUNDO MATCH RACE 2005. Mint set 3 values (0,28-0,53-0,78 EUR), printing variety 5S - 5 digits small. 125. Epelsa (07.05) - Montilla: Mañana en el jardín (Morning in the garden). Printing variety 5S - 5 digits small, with text MONESTIR MONTSERRAT. 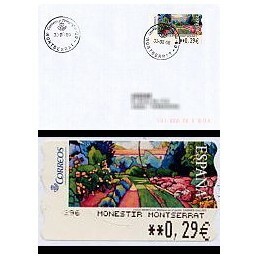 Cover posted with ATM, inland mail - 2006 (0,29 EUR), postmarked Montserrat. 125. Epelsa (07.05) - Montilla: Mañana en el jardín (Morning in the garden). Printing variety 5S - 5 digits small, with text MONESTIR MONTSERRAT. Cover posted with ATM, inland mail - 2006 (0,29 EUR), mechanical postmark Montserrat. 125. Epelsa (07.05) - Montilla: Mañana en el jardín (Morning in the garden). Printing variety 5S - 5 digits small, with text MONESTIR MONTSERRAT. 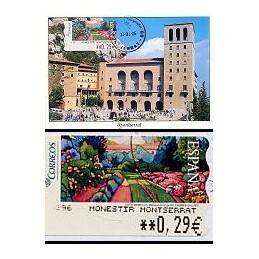 Postcard with ATM, inland mail - 2006 (0,29 EUR), postmarked Montserrat.